Even as 529 college savings plans grow in popularity, there are still plenty of misconceptions about them, including how they work and how they can be used. Myth 1: 529s can be used only at 4-year undergraduate colleges. Actually, your 529 plan assets can be used for qualified higher-education expenses at eligible postsecondary institutions in the United States and abroad. That includes eligible trade or vocational schools, graduate schools, community colleges, and continuing adult education classes. If your child decides not to attend college or another postsecondary school, you can use the money for your own education or pass it on to the beneficiary's sibling, parent, niece, nephew, or other eligible family member. There are no penalties or federal income taxes on the transfer as long as the money is used for qualified higher-education expenses. Myth 3: 529 accounts are only for children. There's no age limit on who can use the money in a 529 account. Whether you're age 8, 18, or 81, you can use a 529 to save for higher education. For older investors who plan on going back to school or finishing a degree, a 529 account can be an ideal tax-advantaged savings tool. 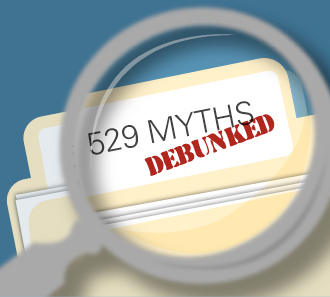 Myth 4: Having a 529 account will hurt our eligibility for financial aid. Financial aid policies differ widely among schools, and all your assets (including 529 plan accounts, bank accounts, and other holdings) will most likely be assessed as part of your child's qualifications for aid. However, because your 529 account is considered to be your asset (not your child's), it will have a relatively minor impact on financial aid. Eligibility for federal financial aid will be reduced by no more than 5.64 percent of your 529 savings. It's also worth noting that a 529 account owned by a grandparent won't affect financial aid status, since a grandparent's assets aren't factored into the eligibility assessment. However, distributions from a 529 account owned by a grandparent may be reportable as student income. The truth is out! To learn more about college savings and take the mystery out of 529s, review the information available on nysaves.org.